I graduated from Archbishop MacDonald High School in Edmonton in 2010. I decided to pursue my passion for music and began studying violin at the Brandon University School of Music that fall. I am currently in my fourth year, and will graduate this spring. In the summer of 2011, I had the opportunity to train and tour with the National Youth Orchestra of Canada, and in 2013 I appeared in the Young Artist Series of the Tuckamore Chamber Festival in St. John’s, NL. I enjoy playing a variety of different types of music, and as well as classical violin. I love to fiddle. In this capacity I have played shows across the country with a number of bands. In the last year and a half, I have become part of a wonderful organization called Manitoba Artists in Healthcare. I play music at the Brandon Hospital and Assiniboine Centre, on a weekly basis, as well as at various personal care homes in Brandon. It has been a really special experience to see my music positively affecting the patients and residents of these facilities within an hour, as well as over weeks and months. During my time in Brandon, I also have been lucky enough to receive over $10,000 in scholarships and bursaries from BU, as well as number of scholarships and the Victor Krahn Memorial Trophy from the Brandon Festival of the Arts. I grew up in Edmonton, AB, where I lived until I moved to Brandon for University. My parents actually met at BU where they both studied music, so naturally, I grew up in a very musical house! My mom was a classical violinist and taught me violin until she passed away when I was 8. My Dad’s family is of Ukrainian descent, and so my childhood was filled with Ukrainian cultural traditions, music, dance, and religion. I continue to be very proud of my Ukrainian roots to this day! More recently, my Dad moved to St. John’s, Newfoundland, and as a result, I have had the chance to explore new styles of music, including Irish and Newfoundland music. My family has always been important to me, but being able to perform music with my Dad and younger brother is something that I’ve recently really come to appreciate. Music has always been a key component of my life. My first violin was actually bought for me before I was even born, so needless to say, I didn’t have much choice in the matter! However, after many childhood years of despising practicing, I eventually came to realize that I really did love to play the violin. A few years after that, I made the decision that doing what I loved was more important than entering a field that I wouldn’t enjoy for reasons of financial stability. I value the fact that music is a unique outlet which helps me reach out to other people, and also teaches me more about myself every day. My current plan is to go on to Graduate school for violin and obtain my Masters, and maybe even a Doctorate. I would love to play in a professional Symphony Orchestra somewhere in Canada, but I would also love to tour with a band. Hopefully I will have the opportunities to do both. I would like to nominate Maria Cherwick to receive our International Women’s Day exceptional female student honours. Maria is a fourth-year violin performance major in the School of Music and in many ways a model of contemporary musicianship. She is a highly accomplished violinist and leader among her peers, serving as concertmaster of the BU Orchestra as well as the orchestral manager. Maria won the 2013 School of Music Concerto Competition, performing as soloist in the Barber violin concerto. She represented the School of Music leading string workshops in Saskatoon in February, and is also currently a semi-finalist in the Winnipeg Women’s Musical Club Doris McLellan Competition for solo performance. Maria’s extra-curricular musical dance card is nearly always full. 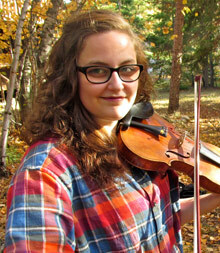 She participates in jazz small groups, Celtic bands as a fiddler, has studied fiddle music across Canada as well as touring and performing widely in Ukrainian folk music ensembles. Maria is talented, motivated, positive and patient: an exceptional student and role model for others.